Hong Kong-listed Courage Investment Group is spending $10.88m to buy a secondhand supramax bulk carrier in a move to expand the scale of its shipowning business. Courage Investment is the reformed group emerging from the restructured dry bulk shipowner Courage Marine. 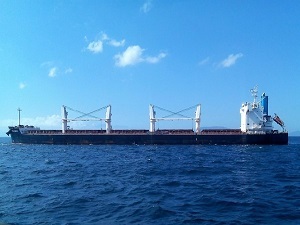 The 2011-built supramax is the 57,000-dwt Marshall Islands-flagged Grand Pioneer, owned by a major shareholder. “The group intends to increase the carrying capacity of its dry bulk fleet through acquisition of the vessel. The acquisition is in line with the corporate development strategy of the group to expand the scale of its marine transportation services business,” Courage Investment stated. The Grand Pioneer is scheduled to be handed over to Courage Investment by 31 December 2018.